cordeliaflyte has no other items for sale. 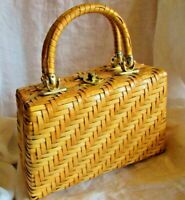 Vintage 1950 Wicker Hand Bag Gold Metal Handles - UNIQUE!!! Vintage 1950's Lumured Bead Handbag Purse With Flowers Made in USA Amazing!! !